Whether you’re a homeowner, a builder or project manager, and whether you want a new roof, replace your existing roof, add a skylight or protect your gutters, KITELEYS’ roofing and building products specialists can help. KITELEYS can help bring more natural light into your home and advise you on the best options for ventilation. With 60 years’ experience, and a wide range of satisfied customers throughout NSW, KITELEYS was the obvious choice for this building project. With 60 years’ industry experience KITELEYS is a trusted name in roofing and building products and installation services. 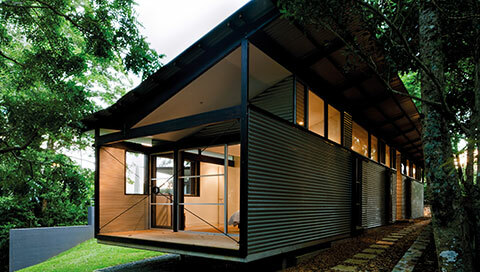 KITELEYS is a wholly owned subsidiary of BlueScope Steel Ltd, using only high quality, COLORBOND® steel products manufactured by Lysaght, made in Australia, for Australian conditions. Our service includes the supply of all materials, installation, rubbish removal and after-sales support, and is covered by industry leading warranties, backed by Lysaght and BlueScope Steel. One of the first things we considered when we first viewed the plans for our project for Huskisson, was how complex the roof line appeared. Not only was the roof a dominant feature, but 3 of the villa’s were double story. They were looking directly over the single story villa’s. This meant that it was critical to get the roofing just right. When we mentioned this to GJ Gardner’s, they assured us that KITELEYS were the right people for the job. I’m happy to say that they were 100% right & KITELEYS did a fantastic job! Nowhere more can this be seen as when we did the footage for our website & we had the drone fly over. The roof was flawless!